Sen. David Vitter (R., La.) announced on Thursday that he is blocking a vote on the nomination of the acting director of the Office of Personnel Management (OPM) until the agency responds to inquiries regarding their role in Congress’s Obamacare exemption. The Republican senator has been investigating a special exemption that Members of Congress and their staff received from an amendment to the Affordable Care Act requiring them to enter into a health care market that did not offer any provisions. The Office of Personnel Management issued a final rule in October 2013 declaring Congress a "small business," despite its having more than 12,000 employees, allowing them to collect taxpayer-funded subsidies that are not available to large employers. Vitter’s letter to the Acting Director of OPM, Beth Cobert, warns that due to the agency’s failure to respond to previous inquiries on the matter he will block a vote on her nomination until the information is turned over to his Senate office. 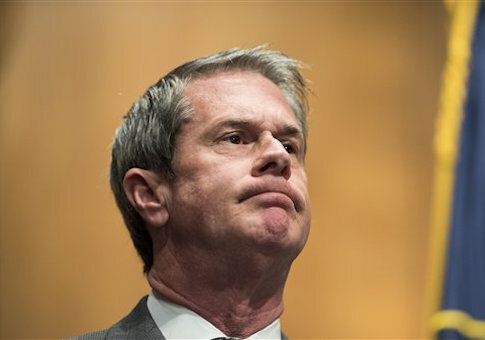 Vitter also requested all correspondence between OPM officials and members of Congress and their staff leading up the issuance of the final rule by close of business on March 11. "It is not easy for Americans to trust their leadership in Washington when Congress cannot seem to figure out if they are a large employer or a small business," the letter states. "Furthermore, congressional employees could be submitting fraudulent documents to the IRS, potentially committing a crime, if you still insist Congress is a small business." Vitter is referring to tax forms that were recently distributed to Senate offices for an "Applicable large business subject to the employer shared responsibly provision contained within the Affordable Care Act" despite entering into the small business market. The Washington Free Beacon contacted the IRS on Feb. 18 seeking comment on the forms and letter Vitter sent to Commissioner John Koskinen at the time. In a returned statement, the IRS said that "have received the congressional letter" and are "reviewing it and will respond." No response came. The Free Beacon contacted the same spokesperson early Thursday morning but has yet to receive a reply. The actions of OPM and Congress led a coalition of 10 watchdog groups to file a complaint last year seeking an investigation into whether members of Congress and their staff committed fraud when applying to the health insurance market. "As open enrollment approached in 2014, members and staff realized that by enrolling as individuals, they would no longer receive generous taxpayer-funded contributions to help pay their insurance premiums as they had for decades under the Federal Employees Health Benefits Program," Citizens Against Government Waste, which is leading the coalition, said in a press release at the time. "They would instead only qualify for subsidies if their household income was less than 400 percent of the federal poverty level, just like millions of other Americans that had to purchase insurance in the individual market." Sen. Vitter said that Cobert’s nomination will not move forward until answers are given on Congress’ Obamacare exemption. "As much as federal bureaucrats enjoy hiding behind layers of red tape, we have now reached the point where OPM can no longer avoid explaining how Congress was allowed to purchase health insurance as a small business—when it clearly is not," Vitter said in a statement. "Ms. Cobert’s nomination will not move forward in any capacity until the American people have received answers as to why Washington’s Obamacare Exemption exists." A spokesman for OPM said that the agency is in the process of reviewing Sen. Vitter’s request and referred the Free Beacon to remarks made earlier today by Rep. Elijah Cummings (D., Md. ), who defended Cobert and called for the Senate to confirm President Obama’s nominee as soon as possible. This entry was posted in Issues and tagged David Vitter, Obamacare. Bookmark the permalink.